Alright... Because I'm taking care of a pregnant cat [more on that tomorrow], working a part-time job, trying to completely revamp this website, and blogging for Metromix about RWDC, I've been a little slow with these blogs. 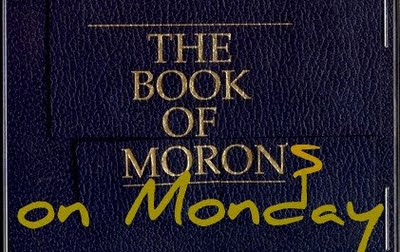 Unfortunately, for Morons on Monday this week, I want to share some stories, but I don't have the time for a Pop Quiz! However! I do have some links and teasers for ya! An old lady constantly feeds bears that come to visit her, then she "mysteriously" dies. Hmmm, I wonder what happened to her. If your milkshake isn't everything you hoped it would be, don't torture yourself by drinking it... Torture someone else with it. Literally. If you like CSI, and your birthday is coming up, don't be alarmed when your house turns into a crime scene. AKA it may not be the best idea to call the cops before going inside this time. A good reputation: Robbing toddlers. I'm sure they have a lot to steal. If you're going to go after someone's wife, make sure that man doesn't have enough money to do this. Especially if you're a public figure or celebrity. How you know you had a good night: You wake up in another person's hotel room. Naked. Without them having any idea who you are. Note to the cops: I don't think it's the smartest of all idea to flag down cars with a bright orange sticker to say "This car has something worth stealing in it." Hopefully you can learn a few things from those links! If not, you better get a good chuckle!